J.M. (Jeanette) Dover writes fantasy, penning short stories as well as middle grade and YA novels. Jeanette loves using both sides of her brain. Her past careers as a social worker, a fashion designer and an accountant prove she can be both creative and logical—sometimes strangely at the same time. Being a writer gives her a way where the two sides of her mind can play happily together. She lives with her husband and requisite writers’ pet (in this case, a loudly opinionated sheltie) in Calgary, Alberta. I am on a quest to convert everyone in this world, and all other worlds we conquer, into zealous book lovers. My plan is to catch them when they are young, before they can form an aversion to the written word. If you are already a reader, you can help me achieve my sly plan by recommending books you love to others. ​If you know of a non-reader, especially a young non-reader, I urge you to convince them to give only one book a chance. Tell them to pick a book where the cover art catches their eye and the back cover copy intrigues them. If they finish the book, tell them to recommend the book to another non-reader. Finding Atlantis is a work of children’s fantasy and science fiction by author J.M. Dover. In this adventurous and exciting tale, our hero is young Adam Danburg. 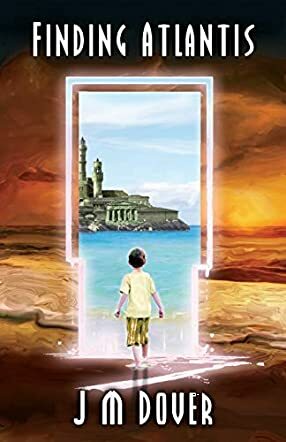 Taken from an ordinary life on Earth, Adam travels across the space-time continuum to discover that the fabled city of Atlantis is not lost after all, but that it exists in a very different way to the rest of the universe. Things have moved on in Atlantis, and there are as many dangers as there are wonders lurking behind the shimmering shores and crystal waters. On top of all this, Adam discovers an incredible ability that he can’t control, and a destiny that sees him bringing either salvation or destruction to the city itself. Author J.M. Dover writes with great creativity and imagination in this fantastic reboot of the Atlantis concept. I really enjoyed the darkness to the tale, which was appropriate and exciting for a children’s novel, up to about the middle grade age of readers. Even as an adult, I found myself thrilled by the mystery of how Adam’s powers were developing and who the rest of the trio are that Atlantis’s fate rests with. The descriptions were lively and the dialogue felt realistic to childhood. Adam is a little precocious for his age, but a charming protagonist whom you really want to see succeed. I would love to read more from this author in the future, and overall I’d definitely recommend Finding Atlantis as a highly enjoyable children’s tale. Finding Atlantis is a children’s fantasy tale written by J.M. Dover. After an argument with his adoptive father, Adam Danburg goes swimming in the ocean. Following a unique fish he finds on the reef, he goes deeper than he’s ever gone before and discovers an ancient stone gate. When Adam touches it, he is sucked down a vortex right into Atlantis. Unfortunately, the gate only goes one way and Adam can’t go back home until he saves Atlantis from imminent destruction. Adam has always had an affinity for nature and finds out that he’s one of the three who was prophesied to one day help save Atlantis. But not everyone in Atlantis is happy with his arrival. Adam has to overcome adversity, learn to wield his powers, and save Atlantis before it is swallowed up in a dark cloud. Lovers of mythological adaptations will love Finding Atlantis which is loosely related to Greek myths about the lost city of Atlantis. J.M. Dover’s Atlantis is a magical place whose population is still living in a medieval culture though they don’t worship the Greek pantheon of gods. Unlike other stories that center around the gods, this story is all about Atlantis and what must be done to save it. You don’t feel like you’re reading another Percy Jackson novel. It was one of the things I loved about this book. Another thing I liked was the focus on family and friendship. What do you do when your parent is doing the wrong thing? Do you choose family or friends? There is an abundance of moral lessons for kids. I will be watching out for more stories featuring Adam and his friends in the future. In Finding Atlantis by J.M. Dover, Adam Danburg has always had a strange connection with nature. Something he could not explain but it has always been there. Above everything, he loves the ocean and 'interacting' with the fish, until one day when his interaction takes him deeper than he should have swum, through a mysterious gate and into an underwater city. Soon he discovers that here he is not Adam Danburg but 'Adam, Son of Earth' and his visit has been long awaited. Adam soon learns why he is in the city of Atlantis and the heavy burden, or honor depending on how one looks at it, that is now on his shoulders. He accepts his mission in Atlantis and even feels more at home here than he does on earth. But what about his family? Will they notice that he is gone? Will he ever go back home? Can he even help Atlantis? Nothing like a combination of adventure and space and time travel to give you a reading experience of your life and J.M. Dover combines all this so seamlessly in Finding Atlantis. J.M. Dover creates amazing character development and setting descriptions which vividly bring the story to life. From the very first chapter, I was able to clearly picture the setting, completely drawing me into the mysterious underwater city, and connect with the characters; each of them unique and intriguing. A captivating plot, relatable characters, and an enchanting old underwater world made Finding Atlantis a definite page turner from start to finish. The simple and flawless writing made it an even more enjoyable read - the kind you don't want to put down until you flip the last page.